Soon to be launched, a new range of lampshades made up in beautiful cotton sateen that will go on sale for the first time on 7 March 2019 at the ‘Spring into Colour’ exhibition at Bristol Tobacco Factory. The range will include six fabric designs and customers will be able to order bespoke lampshades in 20cm and 30cm sizes as pendant and table lamps. 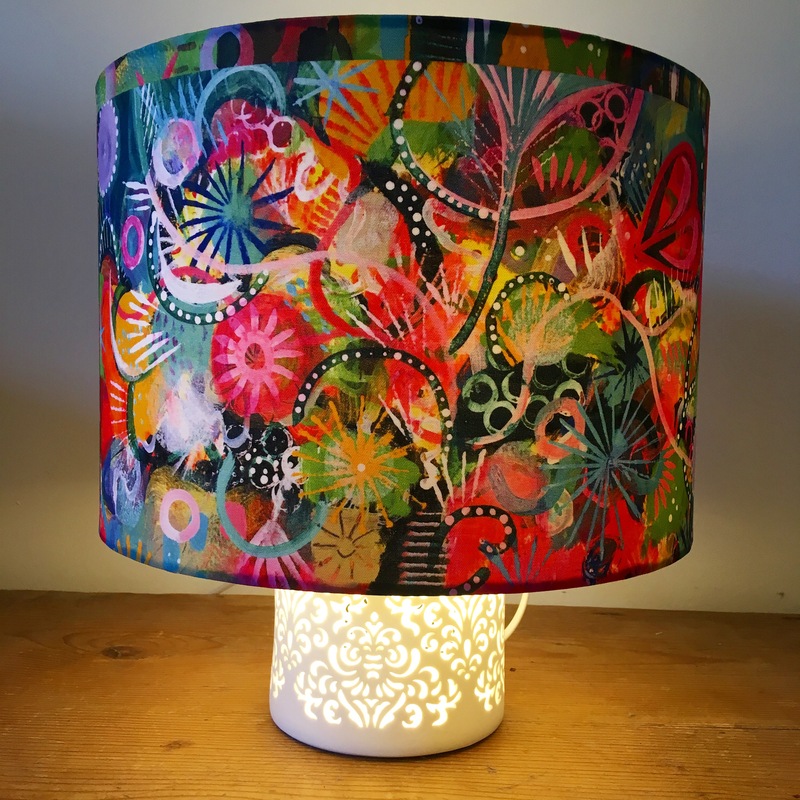 After the exhibition lampshades will initially be offered in the artistintheshed Etsy shop and eventually here on my website once I have activated e-commerce and sourced secure and strong packaging that I feel confident will ensure that your lampshade arrives safe and sound. For many years people had said to me that they thought my paintings would transfer well to textiles. Just recently I started experimenting and I have been blown away by the results. There are so many companies now that make it possible to trial textile design without breaking the bank and with digital printing technology enabling even the most ardent technophobes to create stunning fabrics from drawings and paintings. It’s an exciting time and I’m brimming with ideas about the many, many beautiful home décor products that I will be able to create. When I posted the prototype lampshade on Instagram the response was quite overwhelming with one post gaining almost 3,000 likes and people wanting to buy globally from the USA to Bali as well as locally in my home town, Bristol. This is a new venture and I am just starting up so I decided to write this blog post as a holding page for information. 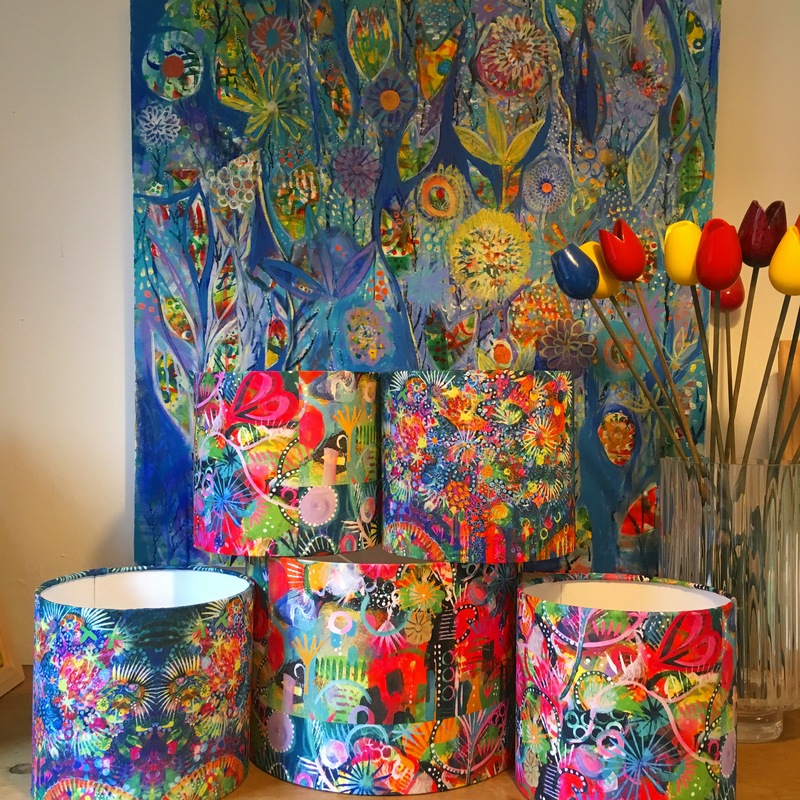 Each lampshade is handmade with love in my shed using textiles based on my paintings. Every product is slightly different so you will be the owner of something unique and beautiful bringing a warm ‘hygge’ glow to your room. Fill out the contact form below if you would like to make an enquiry and to be added my newsletter ‘Colour Notes News’ where I will be announcing products as they become available. If I subscribe you to the newsletter there is a unsubscribe option however I promise never to share your information or to spam.